The Memorial comprised a large pedimented rectangular block articulated by a projecting panel on the east side and flanked on the north and south sides by two lower rectilinear wing walls. A broad semi-circular set of stairs was provided on the east side. These steps both created an elevated platform to better appreciate the detail of the memorial and provided an elevated position to view the context of the memorial in High Street. The memorial was sited on the central axis of High Street with the primary (east) elevation facing towards the Cathedral. 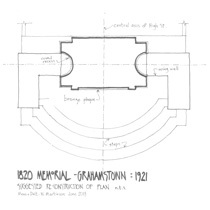 The central block of the memorial was elaborated on the narrower north and south faces by a coved semi-circular niche. A substantial cast bronze sculptured relief plaque was recessed into the upper side of the east face. The relief plaque - in landscape format - depicted scenes of the arrival of the Settlers in the Eastern Cape on sailing ships; the conveyance of families and their possessions on small rowing boats onto the beach; the regrouping on the shore and the loading of people and goods into ox wagons for the journey into the interior. Then the wood failed - Then the food failed - Then the last water dried. The name of the architect of the memorial has not yet been determined and neither has any documentation on the design been located. An initial suggested reconstruction of the plan has therefore been prepared. 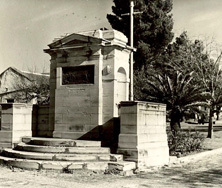 This was replaced by the Memorial built in 1953.